Thank you for your interest in DiCi Art. Please make use of the following press kit. Abstract artist Dielle Ciesco is in love with the quest to express the inexpressible. She is a cultural creative and multipotentialite: vocalist, twice-published author, healer, and artist inspired by color saturation and complement, texture, and feeling. With the rich and vibrant versatility of oils, occasional acrylics, and gold leaf, Dielle aspires to create abstracts that uplift and reconnect us with our deeply mysterious origins. She currently lives in France. A student of Toltec Shamanism for many years, I learned that the word Toltec means “artist of the spirit”. I love that perspective, and I am fully in touch with the fact that spirit is behind my paintings…and in fact, my life-long need to create. I believe that however and whenever even one of us allows life to express itself unhindered through us, it is an act of love that reminds us all who we are. For me, the entire purpose of art is to inspire a deep breath, not a contraction, no matter the emotions evoked. It is to open us, not shut us down. When you view my paintings, you may see the influence of dreams and the ethereal, of color and texture, various styles and masters, but perhaps most of all, movement. My art is my choreography, the brushstrokes creating not only a vision, but if you listen with care, the music that underscores life’s dance. I strive for simplicity in both my art and its message. My paintings are an expression of the inexpressible; they capture a moment (or string of moments) in time and thus are energy taking form. So unlike those artists who paint and sell the form, it is my belief that the value of a painting is what led up to that form. While the form is, of course, what speaks to and inspires the viewer initially, there is always a much more interesting story underneath…one of emotions, thoughts, life experiences, challenges, and blessings. All of this creates the final piece, an assemblage of perspective. But what is perhaps most important is the capturing of a moment of stillness between the unmanifest and manifest, that single moment when that final brushstroke is lifted. 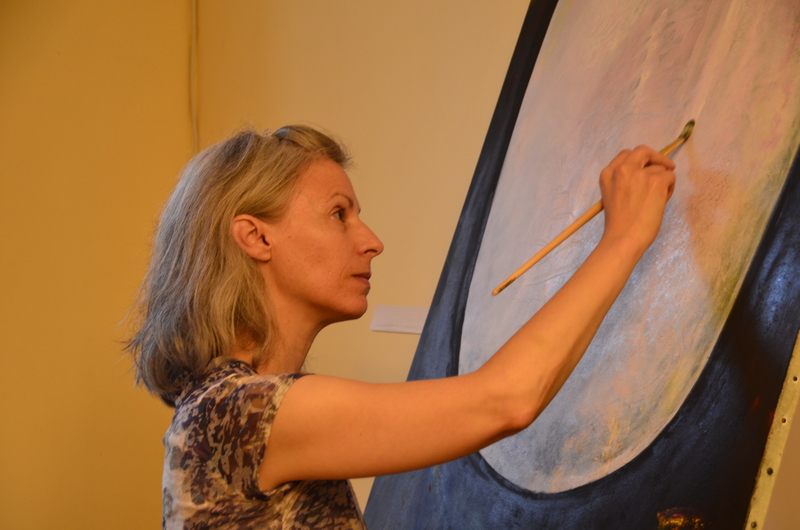 As such, my paintings represent the mystery of life and creation. How do I create? I trust where I’m being led. Very often, it wasn’t where I thought I’d go. That’s all part of the mystery! I have fallen in love with abstraction and symbolism because this combination of styles frees me from the confines of a collective reality I had far too little say in since birth. Abstraction takes me back to my deeply mysterious origins…that black primeval womb…from which the fresh and unexpected can arise, while symbolism allows me to express from a deeply personal perspective. Through painting, I am in the act of being most myself…a channel for creation. A common element in my paintings are metallics. This isn’t because of any perceived value of precious metals but rather for their light-reflective qualities. I want to create works that evoke more than just a feeling or an image, but that transmit and feed light to the eye, as well as wild and deep beauty and the warmth of healing. That seems to be what the world is most sorely lacking. I’m not really interested in chaos or heavy drama. I prefer to tap the unadulterated Divine order and more rarefied energies of human experience. Dielle’s work is always on display on her Facebook page, DiCiArt. 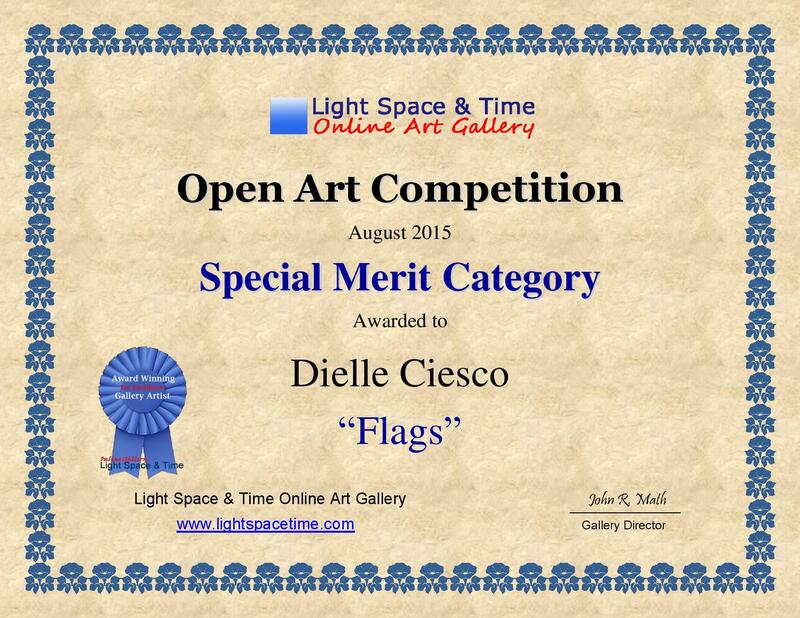 “Flags” in Light Space & Time’s “Open” Exhibit 2015 Special Merit Award out of over 700 entries worldwide. “Lotus Nebula” in Light Space & Time’s “Abstracts” Exhibit 2015 10th Place Overall out of over 700 entries worldwide. 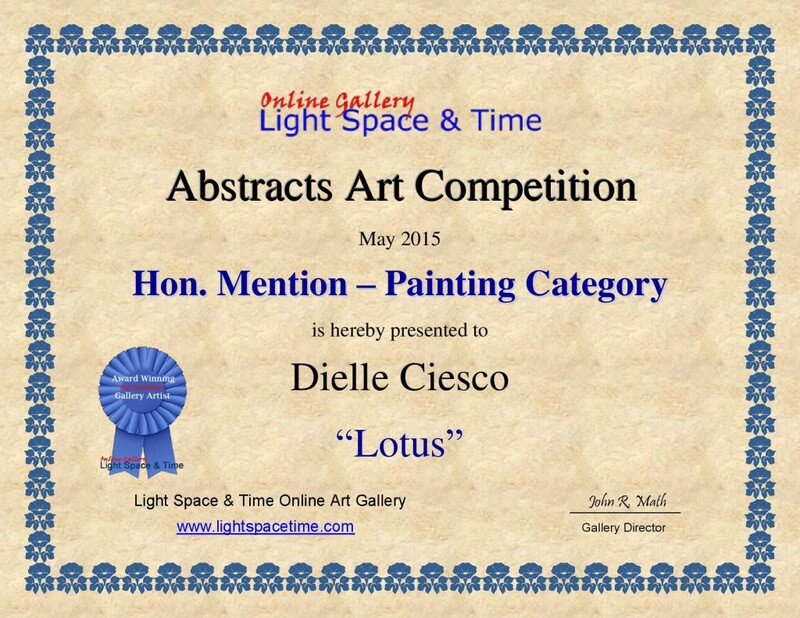 “Lotus Nebula” in Light Space & Time’s “Abstracts” Exhibit 2015 Honorable Mention in the painting category out of over 700 entries worldwide. 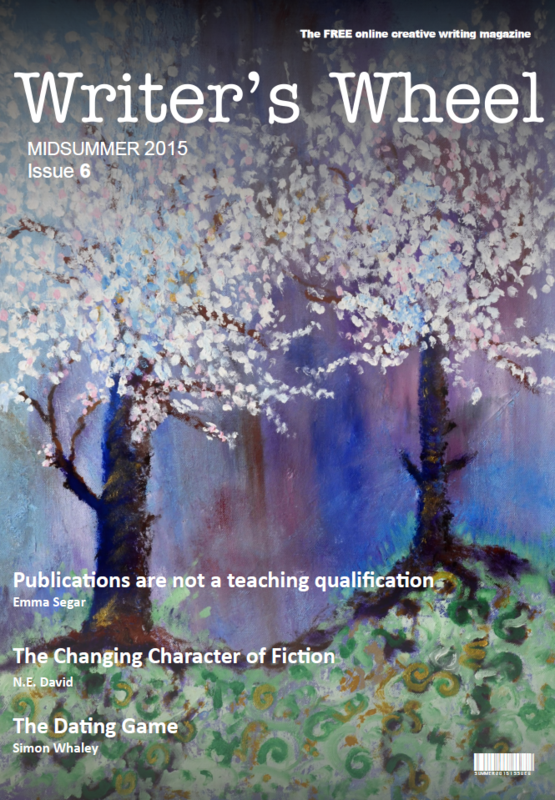 Spring Lovers is the featured cover art on Issue 6 of Writer’s Wheel Magazine, a creative writing resource published by Compass Books.